For a quick and nutritious meal with stick-to-your-ribs appeal, prepare boneless pork chops and side dishes in the same skillet. Instead of browning the pork first, prepare vegetable and apple chunks in the skillet and then cook the pork chops. The meat picks up flavors from the veggies and apples and you can keep the pork moist by adding liquid to create a sauce in the skillet as the chops cook. Wash and dice your choice of fresh vegetables, such as onion, sweet potato or winter squash. Use smaller vegetables such as brussels sprouts, fresh green beans or snow peas whole or cut them into bite-sized pieces. Peel and dice a large apple. 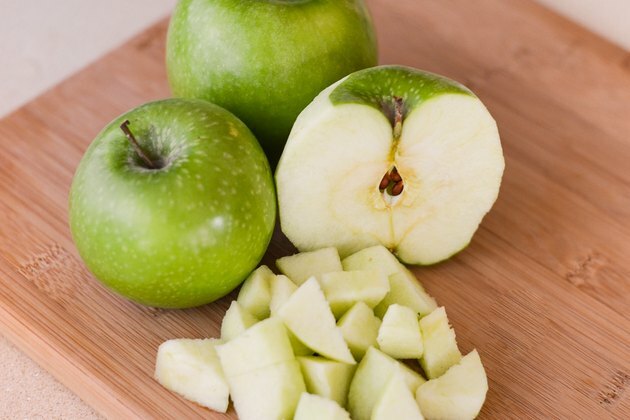 Choose a variety that holds its shape when cooked: Jonathan, Granny Smith and Golden Delicious stand up well. Preheat a large skillet over medium heat and add half olive oil and half butter -- enough to cover the bottom of the pan. Add the diced vegetables, seasoning them with salt and pepper if desired. 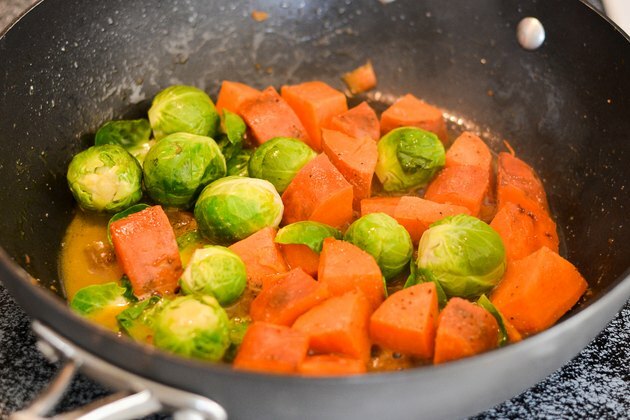 Don’t stir the vegetables until they are lightly browned on the bottom, then turn them to brown on all sides. 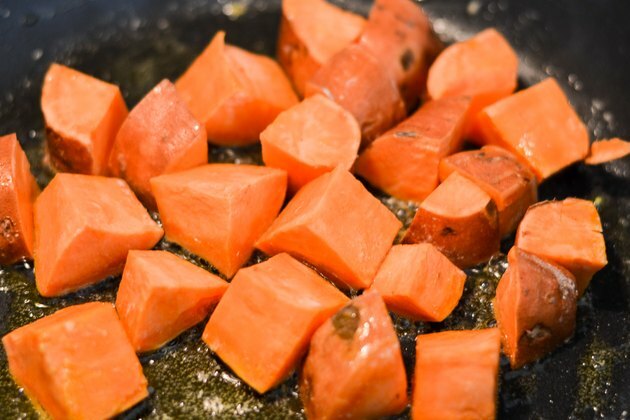 Add some apple juice or apple cider and cover the vegetables with a lid for a few minutes to create flavorful steam so sweet potatoes and other hard vegetables finish cooking. 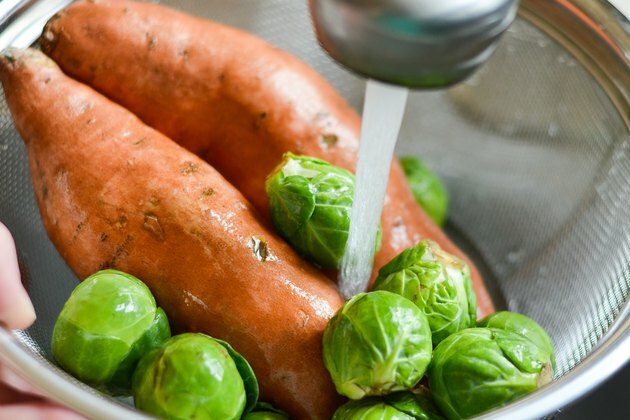 You can add tender brussels sprouts or snow peas when the harder vegetables are almost done. Remove the cooked vegetables from the skillet, add more oil and butter if necessary and cook the diced apples until they are heated through. 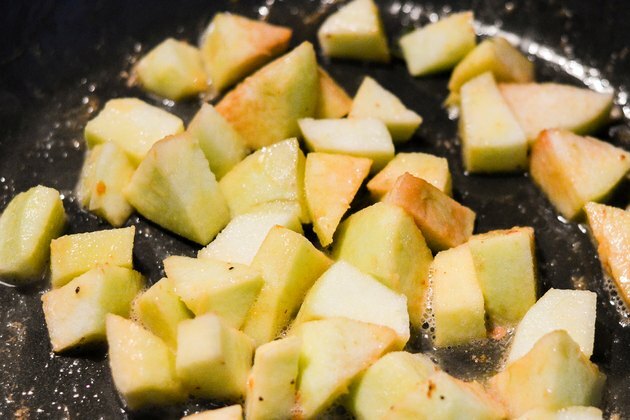 Remove the apple chunks from the skillet. 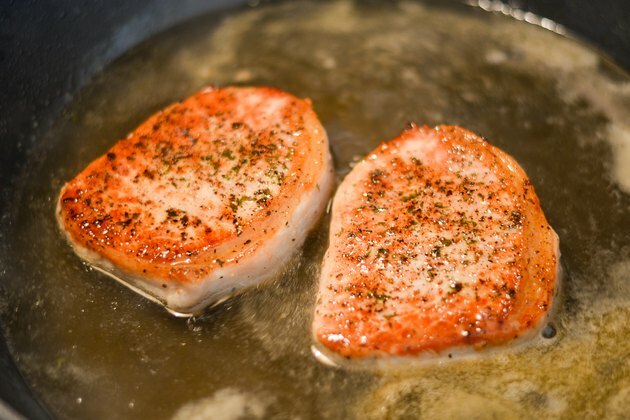 Add more oil and butter if necessary, then place the pork chops in the skillet. Cover and cook for 2 to 3 minutes on each side or until an instant-read thermometer registers an internal temperature of 140 degrees Fahrenheit in the center of each chop. Add apple juice or cider to release the browned bits from the pan, scraping the pan if necessary. This will make a light sauce. Remove the pork chops from the skillet and place them on warmed plates. 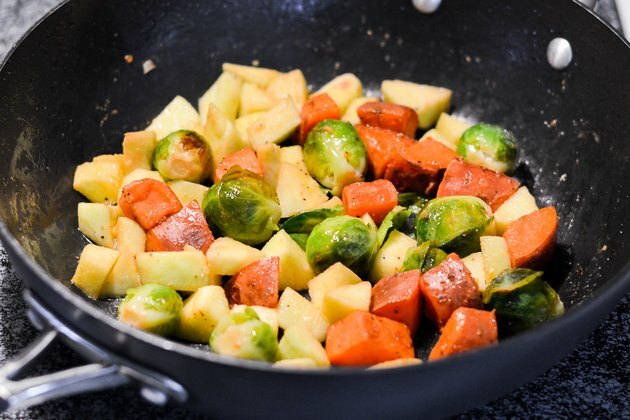 Return the vegetables and apples to the skillet, stirring quickly to coat them with the sauce as they reheat. 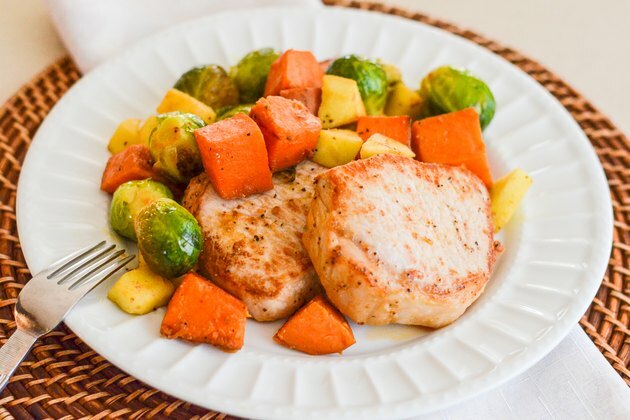 Spoon the warm vegetables and sauce over the pork chops and serve. Stir in grated fresh ginger root or dried ginger powder to the sauce in the pan after removing the pork chops. For a tangy citrus kick, substitute orange juice or orange-pineapple juice for apple juice. Dried cranberries cooked with the apples add another dimension of flavor. Cook a handful of chopped kale with the apples to boost nutrition and flavor. Reduce the cooking temperature, if necessary, to keep the pork chops from drying out. Depending on the thickness of the chops, the cooking time is about 3 minutes per side.